2018 Land Pride 800 Series - 15 Row 800821506 for sale in Norfolk, NE. 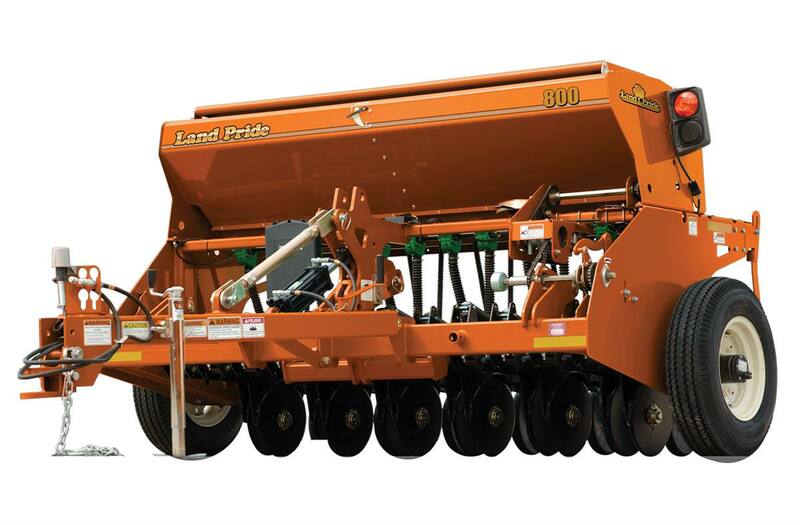 Dinkel Implement Co.
Land Pride's 800 Series End-Wheel Min-Till Drill uses the field-proven 00 Series opener to properly and accurately place seeds. 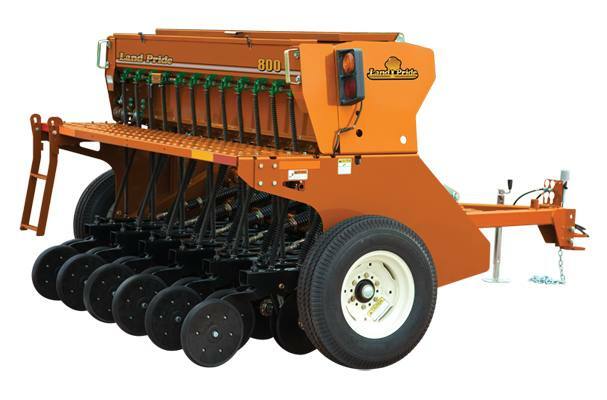 This rugged opener utilizes 13.5" diameter and 4mm thick disk blades, full-length seed tube and an 18-position T-handle press wheel to precisely control seed depth. Due to its central location, adjusting the down pressure on the 5-position opener is quick and easy. Other features include a lock-out hub to free wheel the drive system during transport, “V” bottom dividers for easy clean out, and folding tongue as standard equipment. Choice of 2x13 Single Press Wheel or 3x13 Center Rib Press Wheel: Press wheel options allow tailoring to various soil conditions. 4 Speed Gearbox for various seed rates: Makes seed rates changes quick and painless. Acremeter: Indicates the acres planted. Walkboard & Ladder: Allows you to refill seed from end to end. Lock-out Hub: Disengages all drive components for reduce wear on drive system. V-bottom Dividers: Allows all the seed to feed from the seed box to the feeder cup so you get complete emptying. Seed Box Level Indicator seed: Easy to read from the tractors seat and indicates the amount of left. Folding Tongue: Less storage room required. Calibration Crank: Calibrating your machine will allow you to put on only the amount of seed you desire. Safety Chain: Prevents unit to come loose from towing vehicle. T-handle Depth Control Adjustment: Provides 18 different positions for accurate depth. 2 bu/ft Seedbox: Larger box reduces downtime / more acres per fill.